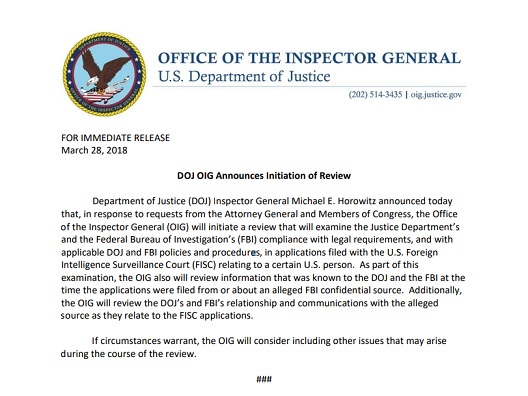 There has been significant confusion about the March 28, 2018 announcement by the Department of Justice Office of Inspector General, informing the public that a review has been initiated into the actions of the FBI and DOJ in regards to their Foreign Intelligence Surveillance Court (FISC) applications for surveillance in regards to a "certain U.S. person." One of the many questions I have seen, showing the confusion, came out as FISA was trending on social media, where a user asked "Ok, forgive me if I'm not up to speed, but I thought the OIG had been investigating the FISA issues for past year. So if it hasn't been FISA keeping him busy for over a year, what else has he been investigating?" The confusion seems to stem from the fact that the DOJ's OIG has been conducting an investigation for more than a year, which is believed to be concluded but the official report hasn't been released to the public yet, although much of what the Inspector General Michael Horowitz had uncovered in the course of his investigation, has seeped into the news, not due to leaks, but because senior level FBI and DOJ employees have been reassigned, been demoted, terminated and removed from Robert Mueller's team, after the IG notified the proper officials of the misdeeds and conflicts of interest he had uncovered. The first investigation, which many observers are waiting to see the finalized OIG report, had specific mandates that are unrelated to the FISA Abuse scandal where senior level officials in the FBI and DOJ used an unverified dossier as a basis to request surveillance on a U.S. citizen, Carter Page, who was once part of the Trump campaign. Congressional investigations have found that those FBI/DOJ officials did not inform the FISC that the dossier was paid for by the Hillary Clinton campaign and the DNC, as well as not informing the FISC the dossier was largely unverified. In the course of multiple congressional investigations into Russian collusion, along with the IG's investigation into the conduct of the FBI and DOJ in relation to the Clinton private server/classified emails criminal investigation (shown above as the first bullet point referencing the dates of the three Comey statements on Hillary Clinton), other information arose during the course of those investigations, that have led to other areas in need of investigating FBI/DOJ misconduct, and to compile documentation so the DOJ has what it needs to determine what, if any, criminal charges need to be filed about the FISA abuses that have been revealed over the last few months. Simply put, in the course of the original investigation into alleged misconduct by the FBI/DOJ in regards to the the Clinton investigation, and former FBI deputy director Andrew McCabe, evidence came to light showing some of the same players being involved in FISA abuses, some of which has been made public, but that wasn't the original mandate of the OIG's January 12, 2017 announcement of that review. Now a separate OIG investigation has been initiated specifically targeting the FISA abuses. Many would argue that a special counsel should be assigned to this task, but a persuasive counter-argument highlights how much information the OIG has already uncovered and exposed, without which the public would not even know about the FISA abuses, the text messages between Strzok and Page, McCabe's leaking to the press, or the part Bruce and Nellie Ohr played in the dossier fiasco, among other things, to make the case that the IG is uniquely positioned to conduct this new investigation into FISA abuses, rather than wasting tax payer money on someone that would have to start from scratch while building team and to catch up with information IG Horowitz is already very familiar with. During the course of congressional testimony, senior officials, such as Deputy Attorney General Rod Rosenstein, often invoked the OIG investigation as the proper entity to conduct investigations into misconduct by department employees. Rosenstein told Representative Jim Jordan in December 2017 that the OIG had 500 employees and a $100 million budget, and admitted the text messages between FBI agent Peter Strzok and FBI Lawyer Lisa Page, which showed that before the 2016 presidential election, they were plotting an "insurance policy," (The Trump/Russia collusion investigation), among other highly suspicious actions, were uncovered during the course of the IG's initial investigation which began on January 12, 2017. With it already being public knowledge that the IG had over 1.2 million documents that he has compiled over the course of the original investigation, those observing and awaiting the final OIG report can expect a number of things once the report is released over the next few weeks. One: Depending on the level of misconduct detailed in the final OIG report, we should be seeing more reassignments, resignations and terminations. Two: The DOJ will be able to move forward on prosecuting anyone the Inspector General has determined acted in the criminal manner. 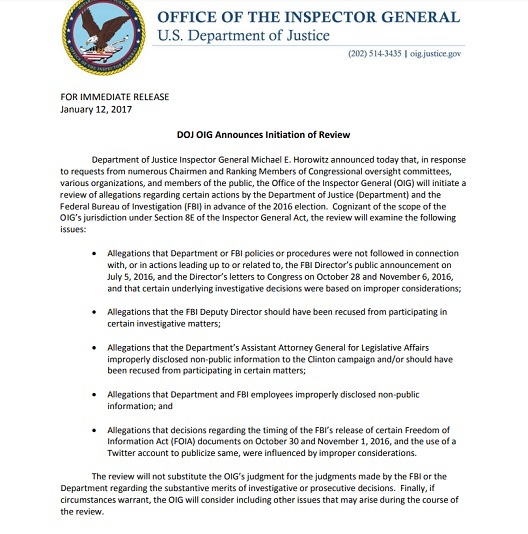 Three: With over 1.2 million documents, hundreds of interviews already conducted for the first IG investigation, many of which already detail issues that "arose during the course of the review," which is now subject to its own investigation, and a huge increase of funding for the next fiscal year for the Office of Inspector General, this one should take a far shorter amount of time to complete. Four: Look for lower level intelligence community employees caught up in the IG investigation to start making deals with prosecutors, immunity for information on higher level officials within the intelligence community, or former members of the Obama administration. New information has been exposed that shows it is not just the FBI and DOJ that were part of a interagency attempt to sabotage a newly elected president, as more text messages have been uncovered between Peter Strzok, who played key roles in both the Clinton investigation and initiating the Russia probe, and FBI lawyer Lisa Page, which shows that there was collusion and coordination between the CIA, FBI, the Obama White House and Democratic officials. The timing of a new report is also interesting as we see that a Minnesota FBI agent has just been charged with leaking classified information to a news website, The Intercept. This is the second person charged with leaking classified information to the same publication. Remember, among the long list of things the DOJ has been investigating, they previously announced they had 27 ongoing leak investigations. At this point many are frustrated at the amount of time these investigations have taken, wondering why we haven't seen more people criminally charged, but the sheer scale of the Obama administration's politicization of multiple intelligence agencies, with the sole goal of creating an issue to undermine a newly elected president, is why the IG has spent over a year on the initial investigation. The twists and turns, the conspiracy, which looks to have encompassed dozens of officials, multiple intelligence agencies, and the former Senate minority leader, all the way up to the White House, is the reason there are over a million documents already compiled for just the first investigation. 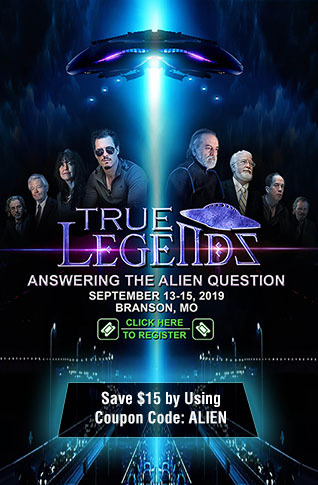 As The Last Refuse points out, months ago the mainstream media were declaring this type of unprecendent targeting of candidate from the opposing political party by a sitting president and his intelligence community, a "conspiracy theory," and now so much has been uncovered during the course of a supposedly unrelated investigation that it is now front page news. For criminal charges to be filed, it is not good enough to "see" the dots being connected with the publicly available information. DOJ prosecutors, using the IG report, are going to have to connect those dots with actionable evidence, enough evidence to obtain a conviction in a court of law, which is why they are carefully lining their ducks up in a row. Once Donald Trump won the 2016 presidential election and all these implicated intelligence community members, current and former, realized that everything they had done, either with the Clinton investigation or the FISA abuses, could be exposed, does anyone really believe that Obama, his admin, or these deep state members, were just going to leave everything out in the open for the Trump appointees to find? The new IG investigation announcement has caused a bit of confusion because many of the scandals involving Strzok, Page, Bruce and Nellie Ohr, Andrew McCabe and others, were revealed during the course of a separate and pre-existing OIG investigation. The fact that IG is officially focusing on the deep state shenanigans in regards to the unverified, Kremlin sourced Steele dossier, which was funded by Hillary Clinton and the DNC, being used without full disclosure to the FISC, to fraudulently obtain FISA warrants to surveil a member of the Trump campaign, brings us one step closer to seeing all their dirty laundry exposed to the light of day. NOTE TO READERS: With the active suppression of revenue for Independent Media by big tech, donations are needed to help keep websites like All News PipeLine alive. Any extra readers may be able to spare for donations is greatly appreciated.